Maybe your tap water doesn’t taste quite right, your dishes have water stains, or you’re concerned about potential contaminants. We can fix that. Let’s get started! Waterite specializes in products for the water treatment, conditioning and purification industry. Its national Canadian network of distributor and water quality specialists supply the residential, industrial, institutional and municipal markets. 1. VECTAPURE 360 Reverse Osmosis series of filtration products is an advanced technology class of its own. The Vectapure 360 series of filtration products is an advanced technology class of its own. The V360 Reverse Osmosis System is a compact, under-sink residential drinking water system that combines the ease of quick-change color-coded cartridges, with an impressive 75 gallon(285 liter) per day output. 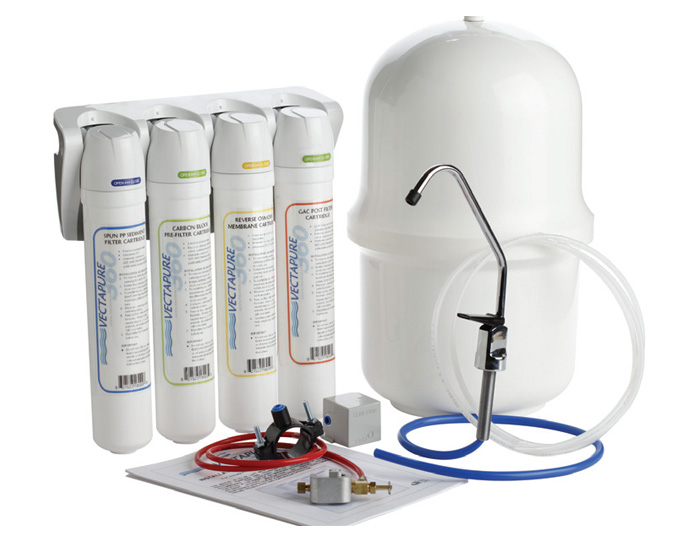 Each system includes all the installation hardware required for easy installation and a space-saving corrosion free storage tank. Pure, refreshing drinking water is always at tour fingertips. 2. The entire family of VECTAPURE 360 Reverse Osmosis Systems share effortless quarter-turn filter cartridges that change in seconds without the need to turn off the water supply. Each cartridge is color for easy and trouble-free selection and installation. Cartridges range from sediment reduction, taste and odour reduction, chlorine reduction and a 0.01 micron ultrafiltration membrane, right through to a unique reverse osmosis membrane. No extra parts need, everything you need is in the box! Vectapure 360 Reverse Osmosis Drinking Water System: Enjoy the benefits of purified drinking water at your kitchen tap. No heavy bottles to transport and you will never have to refill when the bottle is empty. This system can provide better tasting beverages, clearer ice cubes. Filters the home owner can change without tools. 70 Gibson Drive, Unit 14.